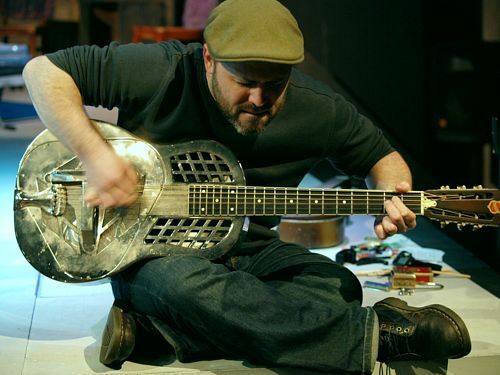 Clifton Hyde is a Mississippi-born guitarist/composer/steel guitarist/mandolinist/producer/French Horn/Baritone Saxophone player/arranger/baritone guitarist currently living and working in New York City. A member of the Blue Man Group , he has performed alongside such notable musicians as Lou Reed , Sigur Rós , John McEuen (Nitty Gritty Dirt Band ), Julee Cruise , Vernon Reid (Living Colour ), Pape Armand Boye, Ray Davies of The Kinks , Patti Smith , Phillip Glass , Michael Stipe , Debbie Harry (Blondie ), and Jesse Selengut among other notables. Making his feature film debut in Sona Jain's "For Real", Clifton performed as pianist for composer/tabla player, Zakir Hussain . His piano and steel guitar can be heard on the upcoming feature film, "Sun Dogs". He has also collaborated with the sculptures of French artist Alain Kirili and the paintings of artist Lou Rizzolo for the World Peace Art Initiative in Stavanger, Norway. He has composed modern classical music for modern dance choreographer Janis Brenner as well as providing music for the Czech-American Marionette Theatre. He has performed in the pit for numerous Broadway/off Broadway shows such as Jesus Christ Superstar , Guys and Dolls , Hair , City of Angels , Return to the Forbidden Planet, Blood Brothers, Tommy , The Three Penny Opera , Little Shop of Horrors , Children of Eden , and many regional and touring companies. Hyde currently works with The Blue Man Group (Zither/Chapman Stick), Tinpan (Guitar, Voice, French Horn, Music Director, Producer), & Gato Loco (Guitar, Baritone Guitar, French Horn, Producer) as well as producing and playing with numerous other projects and musicians. How do you describe your music to people, Clifton? Growing up in Mississippi we didn't have much money but we definitely had a large family. At least 2-3 times a week we would have singing sessions doing everything from Dylan & Beatles tunes to old church hymns & bluegrass standards. Growing up in the South you learn to play for the party. If you aren't getting people laid then you aren't getting invited back. I'm fond of Murray Stenson, Mario Batali , Michel Rolland , Ken Burns , Raggedy Supreme, Dita Von Teese , & Meshuggah . Hopefully some fine wine, candle light, good food, & great tunes...a perfectly made Manhattan wouldn't hurt.